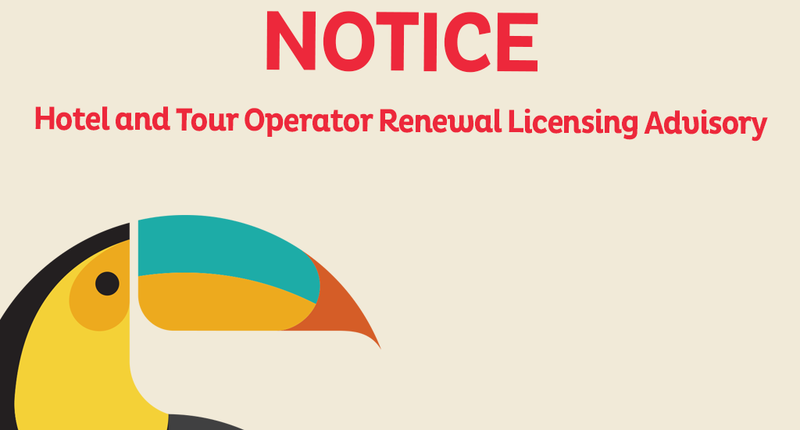 Please be advised that all Hotel and Tour Operator Licences expire on December 31st, 2016. We will be accepting applications for both starting November 7th, 2016. All renewing accommodation properties are required to complete the application form and remit the application fee of $25.00 and the licencing fee of $5.00 per room or accommodation unit. All renewing tour operators are required to complete the application form, submit the required documents and remit the application fee of $250.00. No COD delivery or incomplete applications will be accepted. Be advised that it is an offence to operate without a valid hotel and tour operator licence and any person who fails to comply commits an offence. For more information on the licensing process please feel free to contact the BTB at 227-2420 Ext. 290 or email [email protected] if you have any questions or concerns. Application forms can be picked up at the BTB Office at 64 Regent Street, Belize City, at the San Pedro Office or downloaded from the Resources page on www.belizetourismboard.org.